People aren’t just sucked in by logos and slogans anymore. They want real-time, human, interaction. Now, more than ever, businesses are beginning to make a change in their tone, voice and way that they approach customers. A change that, I think, is for the best. The first hurdle is getting your team on board. If you have a company culture that embraces the change, it becomes that much easier to transition to a new brand voice. If upper management begins by explaining the need for change and how the business will benefit, how the customer experience will improve, the collaborative opportunities it could lead to, how it contributes to the company mission statement, then people will naturally adopt and advocate. Once everyone’s on board, start making it public. Give them a chance to be the face of the brand on social media. When you give people an opportunity to see how the company works from the inside, they’ll think beyond the product & consider the great people who make it possible. No one wants to feel like they’re just a number. Sending generic messages will not make people feel welcomed or appreciated. Automating them is even worse! Remember that you’re dealing with people that have their own likes, dislikes sense of humour and sensibilities. Reach out to them as individuals and you’ll begin to enhance your relationship with the existing crowd. Having a community manager can go a long way. When people know that there’s a real person behind an account, they’re much more inclined to reach out and have a conversation. You’re providing them with a familiar presence that they can relate to. Wouldn’t you rather speak to a real person than a logo? It’s nice to have a face and voice to go with the tweets! Especially if they’re spread across several time-zones! 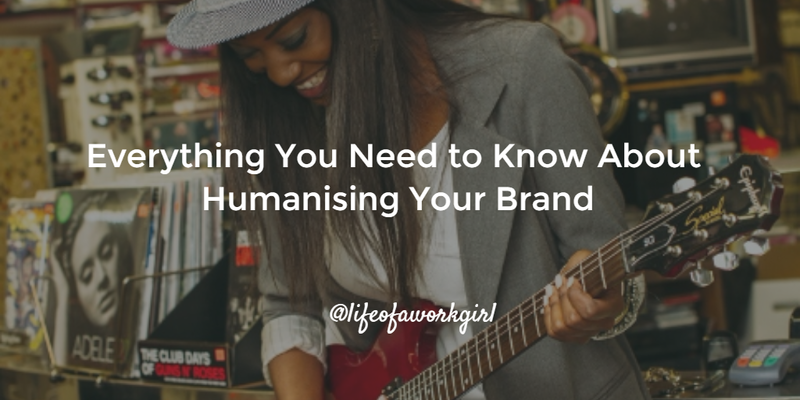 Humanising your brand will be pretty difficult if you aren’t around when the community needs you. Make time to respond to questions, thank people for shout-outs, resolve issues and provide people with valuable information. If there’s one thing you can’t afford to do, it is ignore your audience. Every business will have it’s fair share of problems. Things will happen that you absolutely no control over and, with the public nature of social media, you will be pulled up on it by your customers. There’s no longer a carpet to sweep anything under. Don’t try and hide from your mistakes. Admit to them. And, more importantly, use social media as an opportunity to keep people informed. Take Pocket, for example, earlier this month experienced a server outage for over 24 hours. They had two options: A) disappear off of the face of the earth while fixing the problem and come back to serious backlash or B) Admit that there’s been a technical issue and keep people as up-to-date as possible. Guess which one they chose? I many not have been able to access Pocket on my desktop for a little while, but because of their tact, they’re still one of my all-time favourites. In fact, I’m an even bigger fan than I was before. There are so many benefits to keeping a company blog. You’re providing your audience with insightful industry knowledge for nothing in return. It gives you a chance to maintain your position as a reliable source of information and credible ideas. Not to mention, you can even collaborate with other companies and build sound relationships with them. The more active you are, the more you can contribute and help to educate your community. By creating content, you’re able to gain an insight into what your community wants and needs. Humanizing any brand will take time and effort – which is why it all has to start from within. In order to successfully make this transition, the entire company has to genuinely be excited about providing people with a human experience to the community. In order to create those genuine and meaningful relationships with people, the company’s values must shine from the core of the business. Ads are temporary. So are campaigns. Community is for the long haul so, if you want to have long-lasting and loyal customer base, remember to bring it back to that basic human interaction.